Open concept home design is not going away any time soon. Industry stats continue to report and project this trend’s continued life. Consumers clearly want it so the building industry is providing it. Open concept living absolutely maximizes every square inch available, but it does come with a whole set of confusions for design lovers. How do I end one room and start another? Rooms are either indicated with walls or with furnishings. A family room off a kitchen that is not separated by a wall or knee wall, is still a family room. In open concept design, we will use the back of some of the furnishings to indicate the start of the new room or space. Does everything need to flow? Yep, you bet. Designers call it harmonious rhythm as we design. When we speak to our design-loving clients, we call it flow. This flow is never more critical than in an open concept floor plan. Yes, that drapery fabric in the open concept living room has to be in conversation with the fabric plan in the adjacent dining room and kitchen. Where do I start in an open concept plan? Easy answer: hire a wise designer who will save you untold time, dollars, and worry while delivering love ‘em for life results. Real life answer: if hiring a designer is not in the cards for you, start by thinking of your open concept rooms as one single space – separated into areas by their function and as you will express through your furnishings. That means that when you are planning your furnishings and finishes (hard flooring, cabinetry, countertop, and tiles), it’s really all one thought … broken up into separate spaces that you’d call rooms, and I would, as well, if talking to a client. 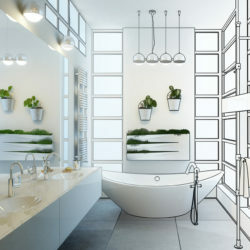 But in the design studio and at the design drawing board, I think of rooms as areas or zones in the open concept plan. As ever in design projects, DO NOT start with your paint plan first. It’s a make-your-life-harder place to start, UNLESS the color on the wall is a massive part of the statement in the space. Better instead to have a general idea of the type of color you’ll want on the wall. The better and most critical place to start with an open concept space plan is with a measured furniture layout plan. 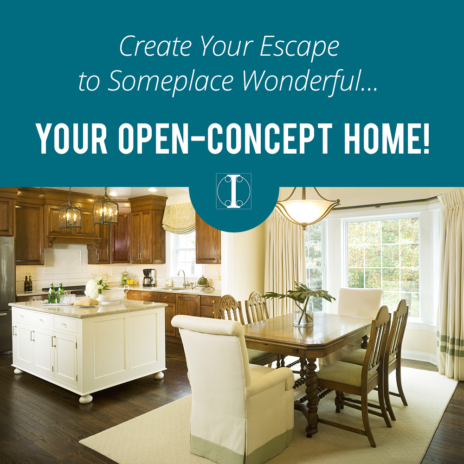 You must see what will work in your open concept plan, what won’t, and why. Do this and your shopping life just got easier. Good luck my open concept space plan peeps. As ever, we are here if you need us to help you create your escape to someplace wonderful … your own home!